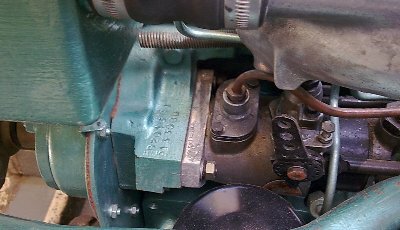 Perkins 4.236 and 4.238 - On early engines, the engine number is stamped on a machined pad on the block, just below the exhaust manifold. On later engines the number is stamped on a label fastened to the block, just above the fuel injection pump. Three systems of engine numbering have been used by Perkins. The first two digits of the engine number remained constant, so for example if yours starts with 71... then you have a 4.107. The remainder digits are the engine number. This time the first three digits remained constant and represent the capacity of the engine in cubic inches. 'U' means that it was built in the UK and the remainder digits are the engine number.